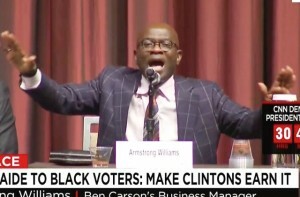 During a National Action Network panel conservative radio host Armstrong Williams took a shot at Bill and Hillary Clinton during a political rant. Yes, the same Williams man who is Ben Carson's business manager, a radio talk show host, a radio mogul, and a guy who was paid $241,000 by President George Bush's education department to promote No Child left Behind on air. (Thought we forgot that last one didn't you?). Did you catch what Williams said there? He slyly made a racial argument against the Clintons by reminding everyone of what Bill Clinton said in South Carolina during the 2008 Democratic Primary. Basically Williams said that black voters shouldn't support Hillary Clinton because Bill Clinton made comments many thought to be negative about a black guy, President Obama. He was trying to pander to the audience before him. It didn't work, but he tried. Aren't conservatives supposed to be better than that?